This week, we returned to Ordinary Time, after the preparation of Lent and celebrating the Easter Season through Pentecost and Corpus Christi. We have entered almost five months of ordinary time as the Liturgical Calendar settles into the rhythms of summer in the Northern Hemisphere. One of the spiritual risks that I often face with the long Ordinary Season without the seasons of Lent and Easter for focus is that my prayer life falls into a deadening routine, where I go through the motions, but mentally and emotionally I am elsewhere; thinking about work, baseball schedule for the kids or the weekend get-away. 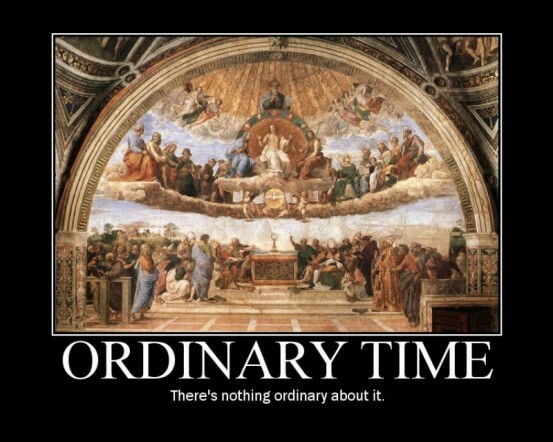 This entry was posted in Sunday Reflections and tagged Ordinary Time. Bookmark the permalink.